Uglyworld #1662 - A Littler Presenter - (Project TW - Image 243-366), a photo by www.bazpics.com on Flickr. Afters all the madnessers this week surrounderings Baz's poor cookies which we thinkers gettered munchereds by a hungriers baggager handler I decidereds that I should does what I cans to puts a smiler backs on Baz's face. 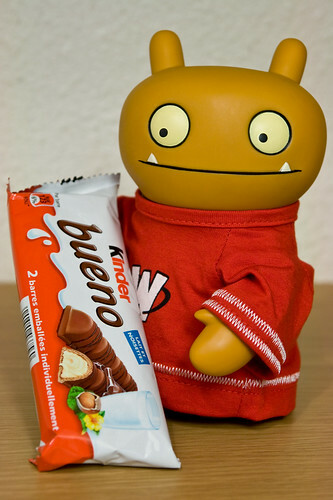 I pickereds up one of his favouriters chocolater bars, a Kinders Bueno, it's such a tastiers snacker, the chocolate just melters in your mouther, mmmm, do you thinks he could waiters just one mores day, and I could eaters this one?